Sailing into Futami Port on the island of Chichijima, a full 24 hours after departing Tokyo, feels akin to Dorothy waking up in Oz: Something says “this isn’t Japan anymore” — except that, technically, it is. 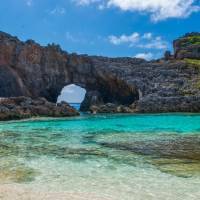 Despite being 1,000 kilometers south of the capital, the Ogasawara Islands come under Tokyo’s administration and the atmosphere could not be more different. 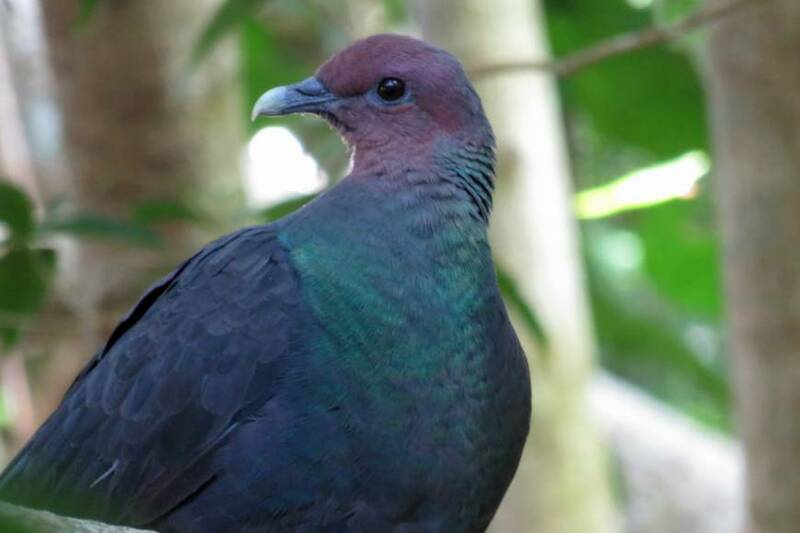 Having never been connected to the mainland, the flora and fauna here is unlike that anywhere else in the world, so much so that UNESCO made the Ogasawara Islands a World Heritage site in 2011. 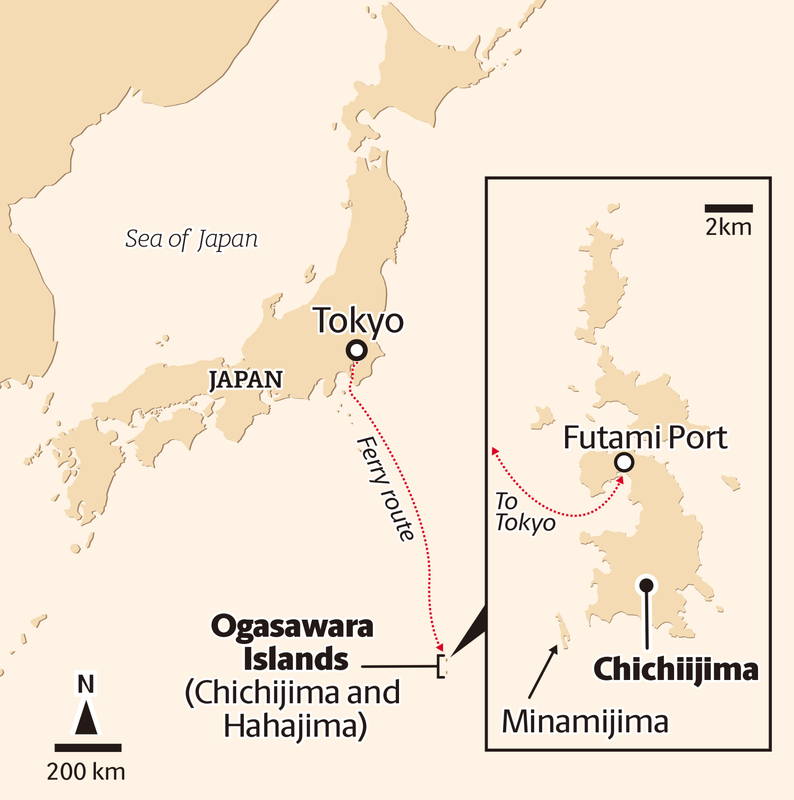 And though the archipelago consists of over 30 islands, only two — Chichijima and Hahajima — are inhabited. Getting there is a small adventure in itself: The only way is aboard the weekly Ogasawara Maru ferry. Onboard, we occupy middle-of-the-range, “premium berth” accommodation that consists of five double-berths in a cabin. Curtains provide ample privacy and our neighbors are courteous and heed announcements to keep the noise down at night. The food is perfectly adequate, the shared bathroom facilities clean and time passes pleasantly enough as the boat charts its course across the Pacific. Upon arrival, smiling locals wave and call out in welcome as we disembark with our luggage. The atmosphere is festival-like. Although some of the details are murky, it is said that Sadayori Ogasawara was the first Japanese to discover the islands in the late 16th century. However, the first colonists to arrive were a group of Americans, Hawaiians and Europeans, who set up camp in 1830, and were led by the aforementioned Savory. This set the stage for a degree of multiculturalism not seen in other regions of Japan at the time. The islands were the scene of several power plays in the ensuing years, with Japan being given sovereignty in 1876. In 1944, the majority of residents were evacuated to the mainland as fighting between Japanese and U.S. troops escalated, and the tragic Battle of Iwo Jima was waged nearby in 1945 on the island of the same name. The Ogasawara group was then under American control from 1946 until 1968, when the islands were handed back to Japan, and those who had evacuated during the war were finally allowed to return. (Hitherto, only around 130 descendants of the original American and European settlers had been permitted to return at the end of the war.) This month marks the 50th anniversary of the return of the Ogasawara Islands to Japan. I knew little of this history when my other half proposed a trip to celebrate our upcoming wedding anniversary and his return to health after major surgery, but once I arrived, I find myself eager to learn more. Sebori tells us how about how his own family was affected, and in some cases even divided, by outside forces. “World War II definitely had an effect on the generation above me,” he notes. Although evacuated to the mainland for safety during the war — where they had a hard time as “outsiders” — the Sebori family were among those permitted to come back under American Occupation. 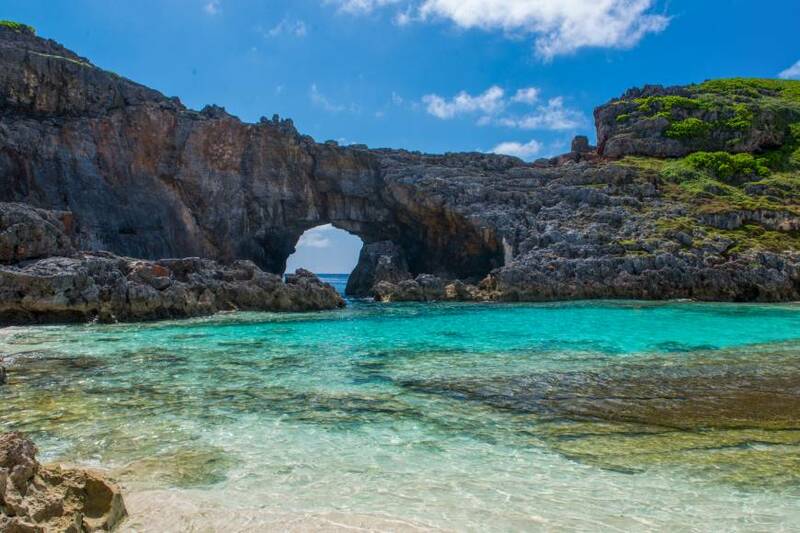 No visit to the Ogasawara Islands is complete without a trip to what is arguably the jewel in the archipelago’s crown — the beautiful, unspoiled island of Minamijima. Like most visitors, we combine this with a tour offering snorkeling, swimming with dolphins and whale watching, and we see plenty of the marine mammals on our way to and from Minamijima. 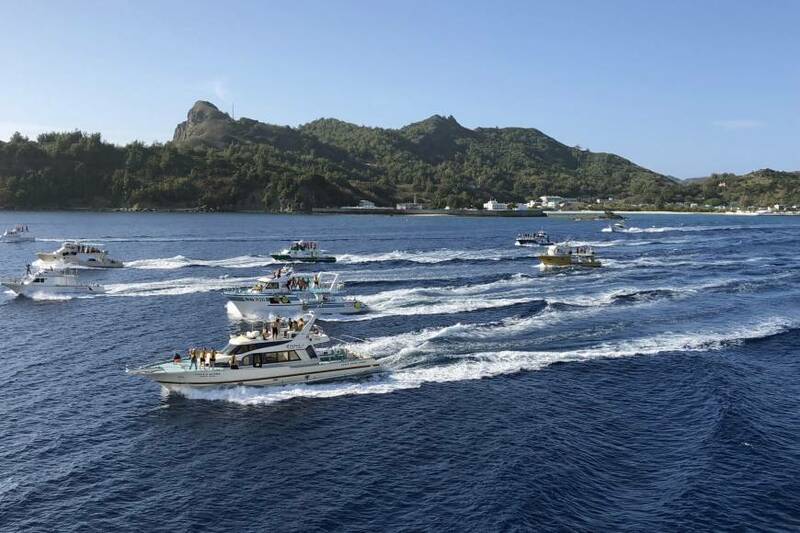 We travel out with a small group of just four passengers, plus our suntanned guide and captain, Naoto Takahashi, aboard the Miss Papaya of Papaya Marine Sports. Minamijima is home to a variety of unique plants, sea creatures and birds, and visits are limited to 100 people a day and even then only to those accompanied by a licensed guide. The pristine white beaches, azure-blue sea and majestic cliffs are a photographer’s dream. Our captain, Takahashi, is a transplant from Tokyo. After visiting Ogasawara as a tourist in his youth, he gained qualifications in sailing and diving and moved here when an employment opportunity rose. He fell in love both with and in the islands, meeting his spouse and raising a son here. This theme is echoed around Ogasawara, which is working to build its tourism while preserving the precious native wildlife. Accompanied by Sebori from Pat Inn, who is passionate about showing guests around his home turf, we embark on a night hike to try and find the vocal but elusive Bonin flying fox, also known as the Bonin fruit bat. After engaging us in a nocturnal game of hide-and-seek, one of the rare creatures eventually reveals itself. The wild cat problem was originally created by humans bringing cats to the islands, some of which subsequently escaped and kept breeding over the years. Close to Pat Inn is what at first glance appears to be a cat cafe but is in fact a halfway house for delinquent felines. Since 2005, cats that have been trapped in the forest are brought here to be de-sexed and assessed for a chance at life as a fat cat in the city. 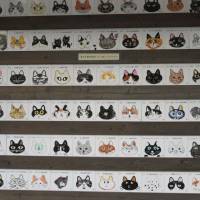 Suitable animals are sent to Tokyo aboard the Ogasawara Maru, where vets cooperate to rehome them. 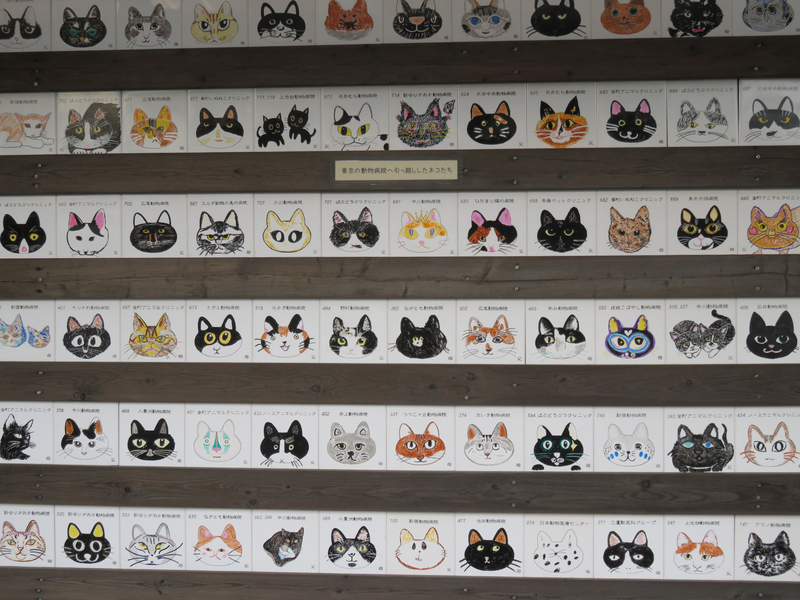 Islanders are also encouraged to register and microchip pet cats. The island’s are not without their romantic streak. On our wedding anniversary, we hike up to the suitably named Heart Rock, again following our agile guide Sebori. Roughly two hours one way, we wend our way through pristine jungle along a trail that is largely unmarked, in an effort to encourage visitors to go with a local guide rather than trying to navigate the route by themselves. At intervals we pass remnants of World War II vehicles — somber reminders of the armies that once saw action in Ogasawara. Finally arriving at the peak, we look out across to Minamijima as Sebori points out whales breaching in the distance. We had a good view of the red rock formation, from the Miss Papaya the day before. While we can only see half of the heart from today’s vantage point, we wholeheartedly agree that we will soon return to this remote and very special corner of Japan. 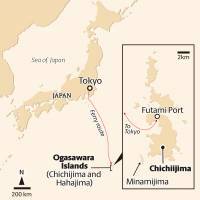 Ferries depart for Ogasawara’s Chichijima island once a week (twice weekly in peak summer months) from Takeshiba Terminal in Tokyo. Journeys take 24 hours and tickets are from ¥23,560 one way. Reservations can be made at www.ogasawarakaiun.co.jp/english.